As the chart above shows, according to Tune, the growth of ad blocking app download by user is growing very fast and this is no good news to publishers like me and you. We put a lot into making the content we provide to our users, so we deserve to get income from running a website the does not provide premium content, don't you think so? 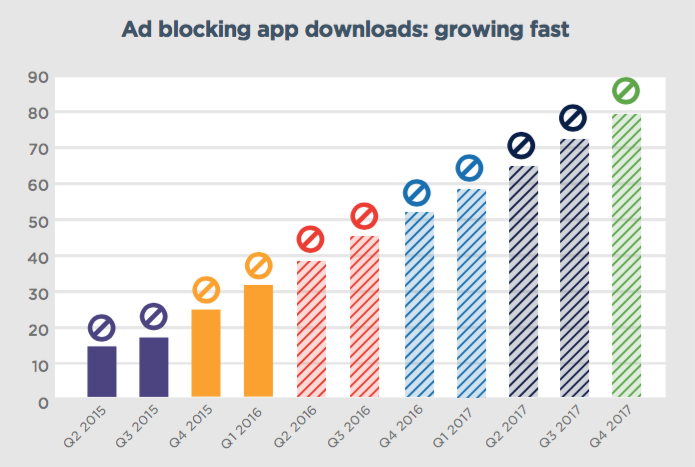 For this reason, I went into deep search on how to get my ads shown to users using ad blocking app, then I discover PropellerAds. PropellerAds is a CPM ad network that offer 80% revenue share for their publishers. And the good news is that they offer anti-adblocking service to their publishers. Sign up with them and your account manager will guide you through the process of using their anti-adblocking service along with their ad-code on your website so that you will no longer be losing any revenue to adblocker users.